Cruel Irony is the story of a family coming to Canada in 1855, following new opportunities to the U.S. in 1870, and settling on the Kansas prairies. And that was the easy part. Check Amazon.com for current discounts.
" . . . Graduate in Nursing and Management of the Insane"
Read Kindle books on iPads, lap tops, PCs, other tablets and of course the full line of Kindle tablets. 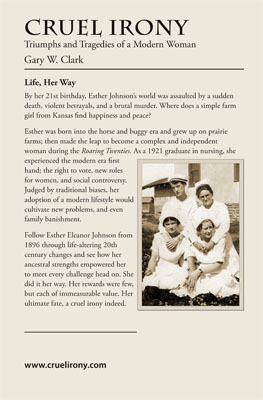 By her 21st birthday, Esther Johnson's world was assaulted by a sudden death, violent betrayals, and a brutal murder. Where does a simple farm girl from Kansas find happiness and peace? Esther was born into the horse and buggy era and grew up on prairie farms; then made the leap to become a complex and independent woman during the Roaring Twenties. 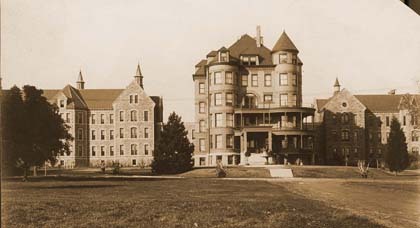 As a 1921 graduate in nursing, she experienced the modern era first hand; the right to vote, new roles for women, and social controversy. Judged by traditional biases, her adoption of a modern lifestyle would cultivate new problems, and even family banishment. Follow Esther Eleanor Johnson from 1896 through life-altering 20th century changes and see how her ancestral strengths empowered her to meet every challenge head on. She did it her way. Her rewards were few, but each of immeasurable value. Her ultimate fate, a cruel irony indeed. This book started as a research project of a family member whose life was surrounded by conflict and controversy from her earliest times. 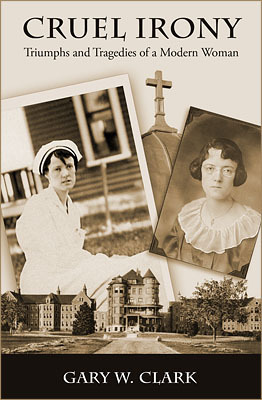 She overcame setback after setback, explored post- World War I freedoms, and became a respected nurse. Her life was cut short in the most surprising manner possible. A cruel irony indeed.